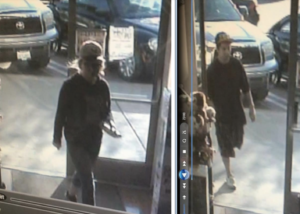 San Luis Obispo police are searching for a pair of thieves who were caught on surveillance film Wednesday using stolen credit cards. On Wednesday, a man reported to the San Luis Obispo Police Department that multiple credit cards were stolen from his vehicle on Tuesday and used shortly afterwards at numerous stores in SLO. Investigators then obtained surveillance footage of two suspects using the stolen credit cards, police said. The police department did not release descriptions of the suspects. It appears from a surveillance image police are circulating that one of the suspects in male and the other is female. Officials are asking the public to help identify the two suspects. Anyone who recognizes either of the individuals is asked to call the police department.